It's happening. Despite getting sunburnt like a total amateur on Monday, this morning I rather regretted not wearing a scarf. The leaves in the park are turning lemon and lime, and there's even a little puddle of golden leaves underneath one of the faster-turning trees. Autumn's on the way! Which means getting the warmer stuff out of the wardrobe, removing the cat from your nicer sweaters, and getting ready to enjoy some cosy fabrics and rich colours. When I ordered loads of amazing stuff from Long Tall Sally's new collection (tip: these trousers are THE BEST), this fantastic red jumper was the lead image on the store's wall. The manager and I just looked at it for a bit going "Cor." Well, it's now in stock for £50. This is Monsoon's new Rosalie dress (£55), which looks like my beloved Vicky (ie: the perfect day dress) in all but name. That print! I love it. It's like being a Laura Ashley sofa crossed with a book of Victorian fairy tales. This dress is a wonderful fit for tall girls, and I highly advise you all to haunt the sales. This skater dress from Tall Girls (£64) is a lovely style. 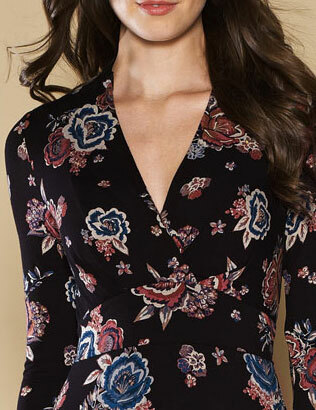 I love the print and the sheer top, and I'd style it just as they have, with thick black tights - M&S has got some fantastic ones in at the moment, go for the XL size - and ankle boots. Every tall girl should own a mini skirt. EVERY ONE. I love a kilt pattern. I have two, and both of them are from M&S - one Per Una affair I got from eBay, and the other a lovely blue and green pencil skirt with pockets that belonged to my mum in the 80s. This red Limited Collection one is fantastic. 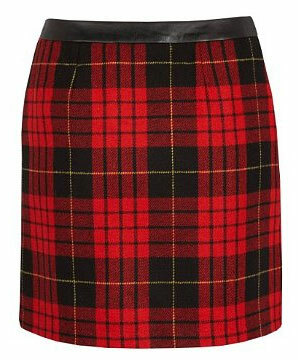 It's got a zip down the back, will go with everything (tartan, weirdly, is a neutral) and costs £35. 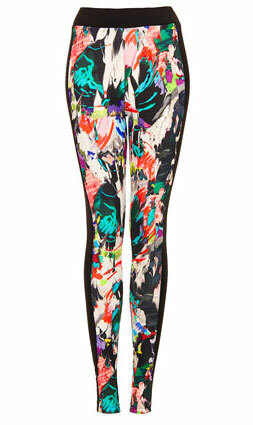 I have such a pash on these Topshop leggings (£28). They just make me smile every time I look at them, and they have black go-faster stripes down the side which make them stylish rather than purely insane. 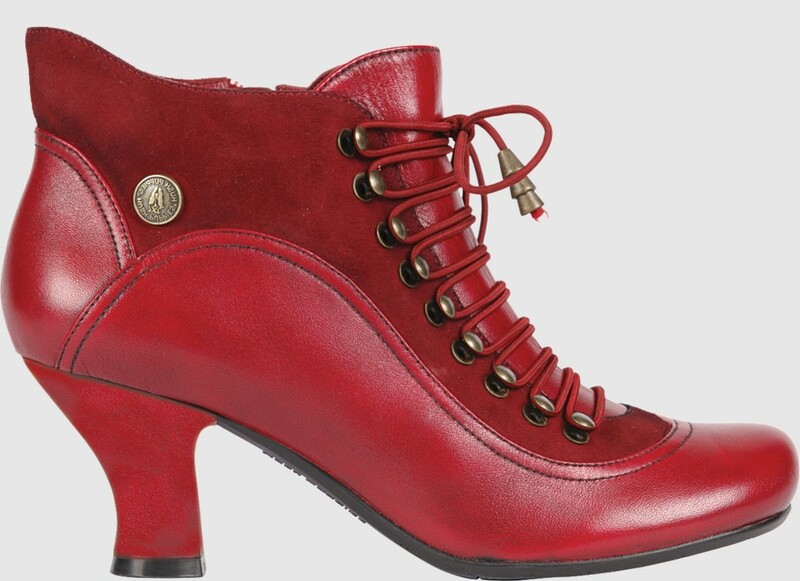 Hush Puppies do a fantastic range of stylish, comfortable shoes up to a size 10, and their new Vivianna range of leather and suede boots is no exception (I've gone quite Victorian all of a sudden - hooray!) They're £80 and available in a rainbow of colours from black to bottle green. If they're not available in your size, order them in to your local department store. I've been waiting for this moment for two whole years. 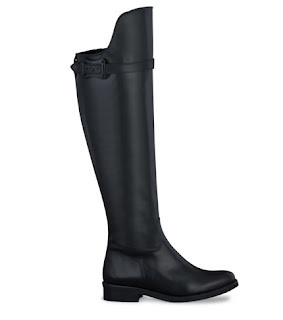 DUO have FINALLY brought out more of their absolutely brilliant over the knee boots. 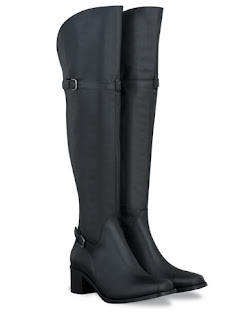 The reason why I've been waiting is that I like my boots to fit me right under the knee, and these are the only sort that do - most knee boots finish somewhere just above mid-calf which is a bit grim. For reasons of practicality I prefer leather in winter, so my favourites are the Beatty (£240) and the Hutton (£220). The Beatty only goes up to a 9, which is a bit of a mystifying shame, but the Hutton is available in a 10, as are the other OTK boots. As ever, you pick your calf size and foot width so they are right for you. Obviously they cost a small fortune, but they really are fantastic quality and will last you for years. Happy autumn! Here are some classic primary school earworms to get you in the mood. My mum used to be a primary school teacher and she says Autumn Leaves is her all time top school song - it makes her cry too! I will forward this post to her immediately (we're both under 5 foot 4 though, so sadly can't make any use of the gorgeous clothes pictured! ).